We received a lot of feedback since we recently launched our unique Photo Compare Tool and we've implemented some of the suggestions. 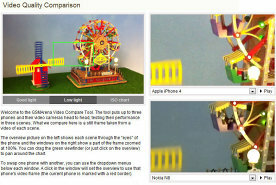 We're also launching a similar tool to help scrutinize the video recording prowess of the cameraphones we review. The two most commonly requested changes were to make the Photo Compare Tool (PCT) more easily accessible (not just through the reviews) and to do something to ease comparing photos with different resolutions. Now, you'd be glad to find out we've stepped up and have answered both requests. Now you will find a new "Check quality" link in the specs page of all handsets added to our PCT database. We've put the link on the row with the primary camera specifications, so it should be easy to spot. Clicking on it will launch the PCT and pit that phone against two related handsets (picked automagically by our Related phones algorithms). We've also added the option to scale the sample photos in the PCT to level the playing field when you're comparing pics in different resolutions. Say, you're comparing a 5MP camera with an 8MP one. 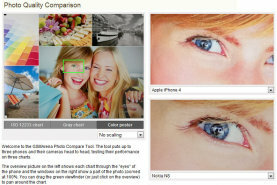 You can set both photos to be scaled down to 5MP (or lower) and see how they measure up then. A good 8MP camera will be sharper when scaled down to 5MP, but sometimes the lower-res snapper will win out when you equalize the resolution (we've seen some bad 8MP cameras come in lately). 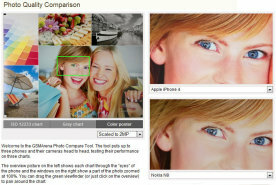 The thing is, when looking at the pictures in native resolution, it takes a trained eye to tell which camera is better. The lower resolution sample might be a bit sharper, but is it enough to compensate for the lower pixel count? The new scaling feature solves this problem, now everyone can judge the amount of detail and noise easily. Today, we're also launching a new companion tool to the PCT - it's called the Video Compare Tool (VCT). Yeah, we know, not really imaginative. Anyway, the thing of the matter is that it compares frames taken out of videos we record in our lab and works much like the PCT. It includes samples only from cameraphones that shoot 720p videos (and possibly higher) and we don't have plans to add lower resolution videos. We've set up two test scenes in our studio and each video is shot under the same reproducible conditions to give each phone an equal chance. The first scene features a mini Ferris wheel setup that hopefully has enough action going and enough fine details. The first half of the Ferris wheel video is shot in good light conditions, while in the second half we dim the lights a bit to give you an idea how the handsets fare in a more challenging light situation. The second reference scene is a bit more straightforward, it's simply our resolution chart, shot on video. The still frames captured from the videos can show a lot - the resolved resolution of videos (by comparing the resolution chart videos), how much fine detail survives the post-processing (the Ferris wheel video is better suited for this), compression levels, noise levels and so on. Of course, a still frame doesn't tell the whole story - there's also framerate, rolling shutter effects and other considerations, which the tool doesn't cover, but still, it's a good starting reference. 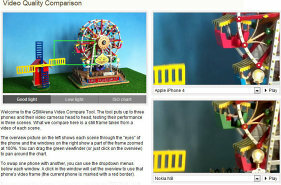 The Video Compare Tool is accessible from the link in phone specifications just like the PCT. As this is a new feature, only phones reviewed since November 2010 that shoot 720p videos are included. We'll upload all of Ferris wheel test videos to YouTube and we'll keep providing real-life samples (along with analysis) in our reviews so don't forget to check those out too! And one more thing, keep that precious feedback coming - we find it immensely helpful. So, if you have any suggestions for improvements or if you find bugs, leave us a comment (and your browser information in case one of the tools doesn't work right). In the Video Compare tool, I can't see the Play button next to each phone's frame. I'm unable to play the comparison video samples. I'm using Chrome. Any idea why this is? It's a website, you can't "download" it. Guys.. please tell me where to download this tool?? ?